This is my piano. At least, this WAS my piano. 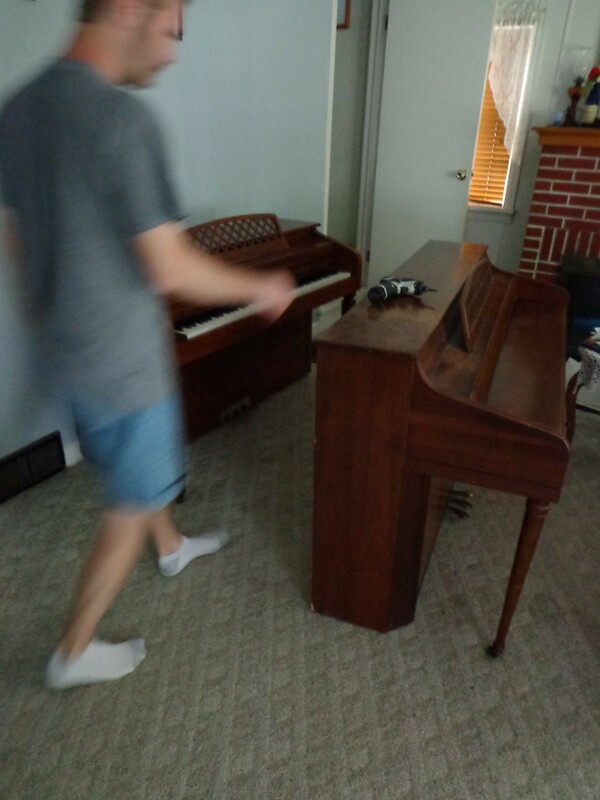 When I was in high school my family moved and I had to leave my old piano behind. It was one of those big ol’ uprights that weighed a thousand pounds. My dad referred to it as my Auxiliary Woodpile and stated that he was NOT moving it with us. My mom and I found this one at a price we could afford (which wasn’t much) and so this is only the second piano I’ve ever owned. It moved with me to my first house, at which time my dad again vowed that he would not move it again. When Jay and I got married I asked him if he would move my piano to our new house, otherwise I was going to have to get rid of it. For some reason he readily agreed and it moved with me. Fast forward a year and a half. Like I said, this wasn’t the most expensive piano, but it was one that we could afford. It definitely is not a Steinway! However, I enjoyed playing it. For Christmas I asked Jay to have it tuned as one of my gifts. 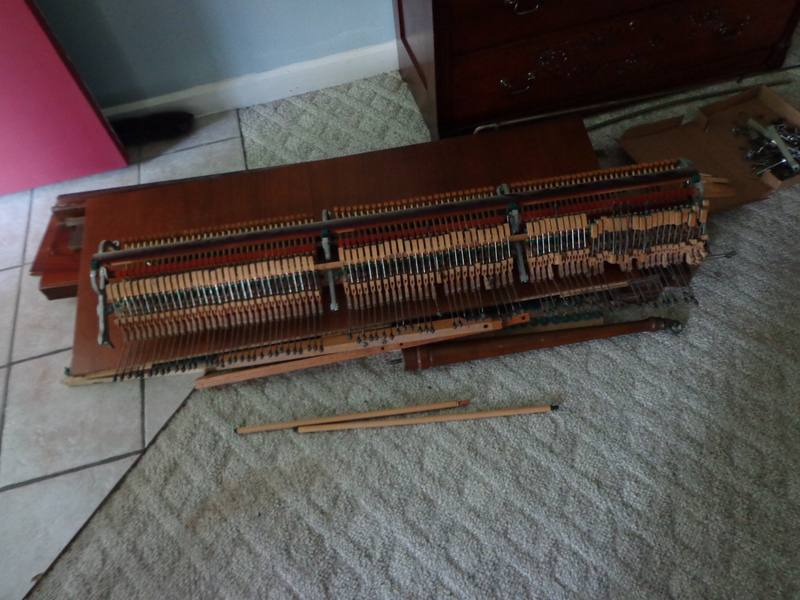 The tuner who did the work told Jay that it really wasn’t a good piano and that he didn’t want to attempt to fix the broken string as that could really snowball quickly. Apparently there’s a high chance of breaking the strings on either side of it when you are trying to fix it. With that being said, and the fact that it was quickly back out of tune, I decided that perhaps it was time to get a different piano. I really didn’t want to buy a new one, but I was getting to the limit of how long I could tolerate the REALLY out of tune note that seemed to be in every song that I played. Here’s where the story gets interesting. 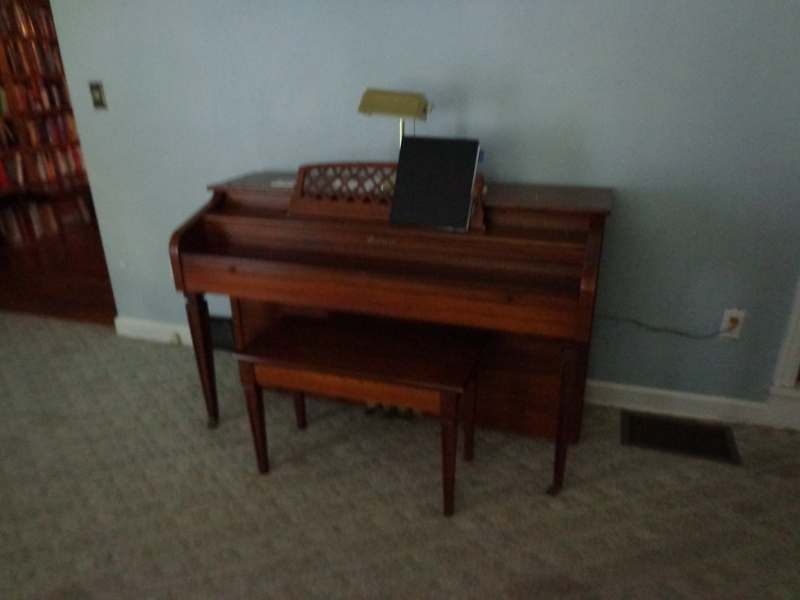 Jay’s mom had purchased a brand new piano back around 1982. She had intended on learning how to play, but life got in the way and she never took piano lessons. It seems that Jay’s brother took lessons for a little bit, but the teacher advised Karen that Justin wasn’t practicing and it would be wiser for her to not spend the money as Justin just wasn’t into it. So there this piano sat in Karen’s dining room, only being played sporadically, until I came along. I tried it out and agreed that I would take it. It was decided that while Jay was on shutdown he would get some guys together and move the piano. Karen only lives three houses away from us, so it wasn’t going to be a huge ordeal. 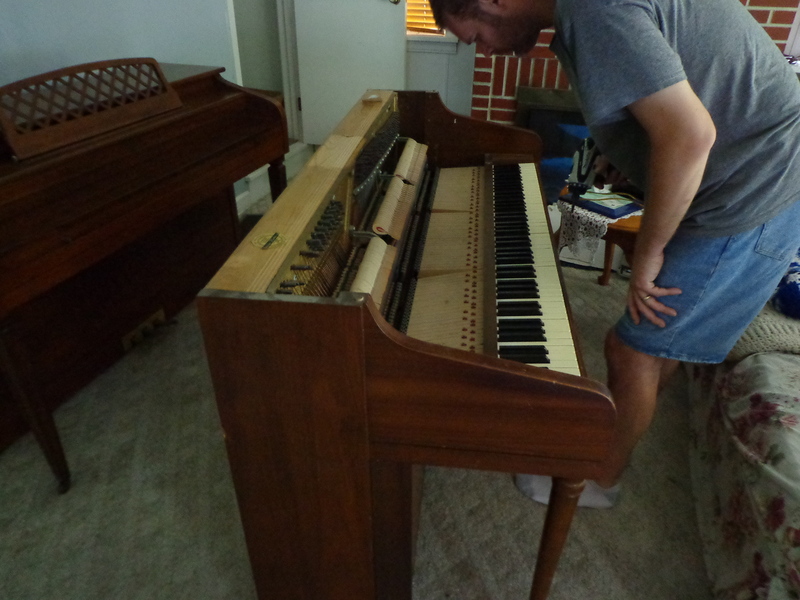 I was worried, though, as I didn’t want Jay to hurt his back by moving the piano. The other consideration was: What to do with the old piano. I didn’t want to sell it because it takes forever for anybody to even want one (I had tried that at one point when I lived on my own). Also, I didn’t want to stick a young student with a piano that had a broken string that couldn’t be fixed and also wouldn’t hold a tune for long. I told Jay that the better thing would be to take it apart, scrap what we can, use as much of it as possible, and then let my dad burn the rest at the campfires he has during hunting season. 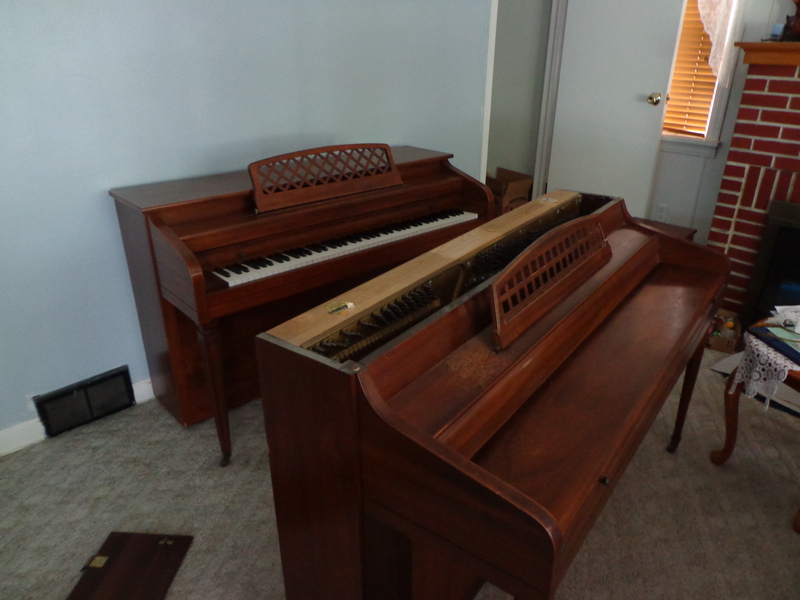 This past Wednesday I walked into the living room and this was what I saw… two pianos. My first thought was, “Please don’t let them fall through the floor! 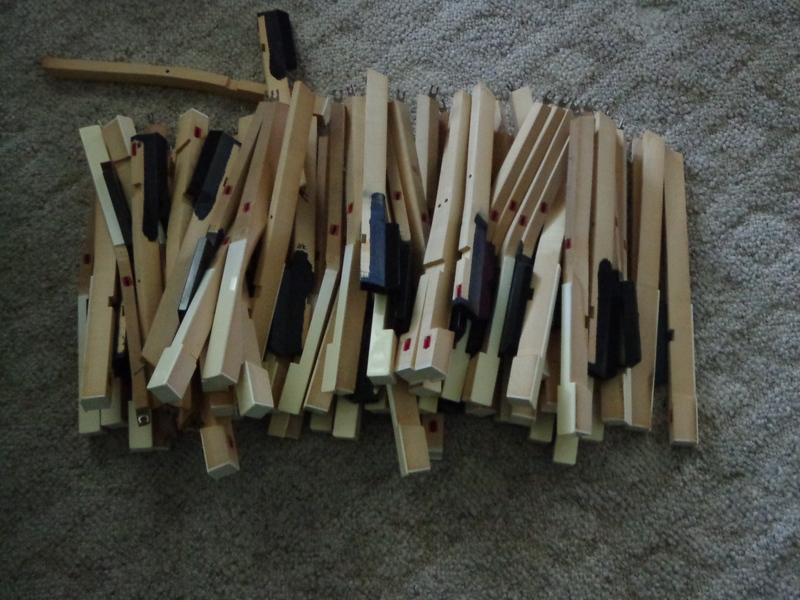 !” If you’ve never lifted a piano then let me tell you… there is a TON of weight in one of these. Thus to have two sitting right there I knew that the joists were under some duress! Jay insisted that I play the new piano to make sure that it was okay before he started tearing apart the old one. I didn’t have any worries, but I did as he asked. It was fine. Let the destruction commence! Jay grabbed the screw gun and got started. Removing the top pieces were easy. His plan of attack was to essentially remove every screw that he could see. 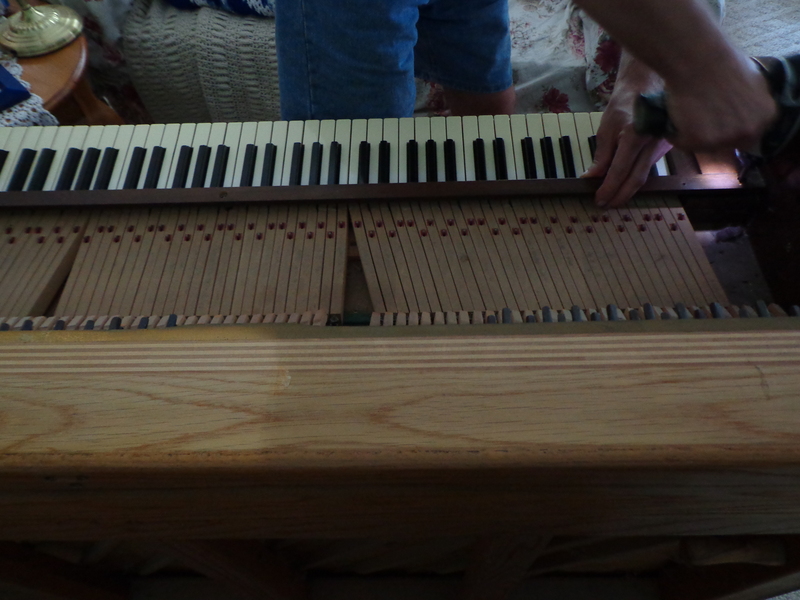 This piano was made of some very nice walnut and oak wood, so Jay put it aside for future projects. It was very dusty and dirty, but I guess that’s to be expected. 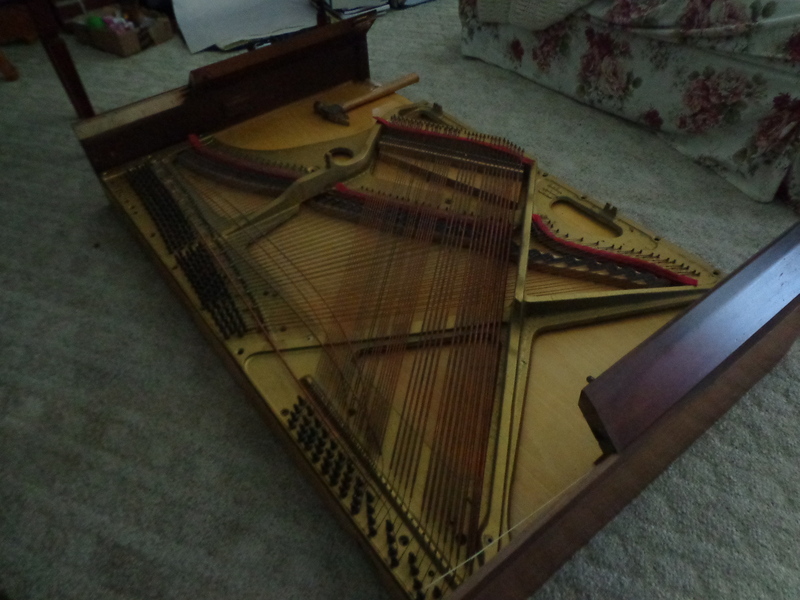 I’ve seen how a piano looks under the hood, but it’s always interesting to see it again. One of the points that stumped us for a minute was how to remove the keys. We had to figure out how they were attached to the hammers, and then after that it was a breeze to get them apart. At this point we ran out of screws to remove. Apparently the manufacturer had also used glue. It took some doing, but we managed to get the pieces apart. At this point we flipped the piano onto its back. Jay’s initial thought was that we could remove the cast iron frame with the strings still attached, but it was quickly determined that wouldn’t work. He went and got his side cutters and we cut all of the strings off. To keep them from flying across the room I had to hold a pillow against them and hope that I didn’t get hit when the tension on the strings was released. 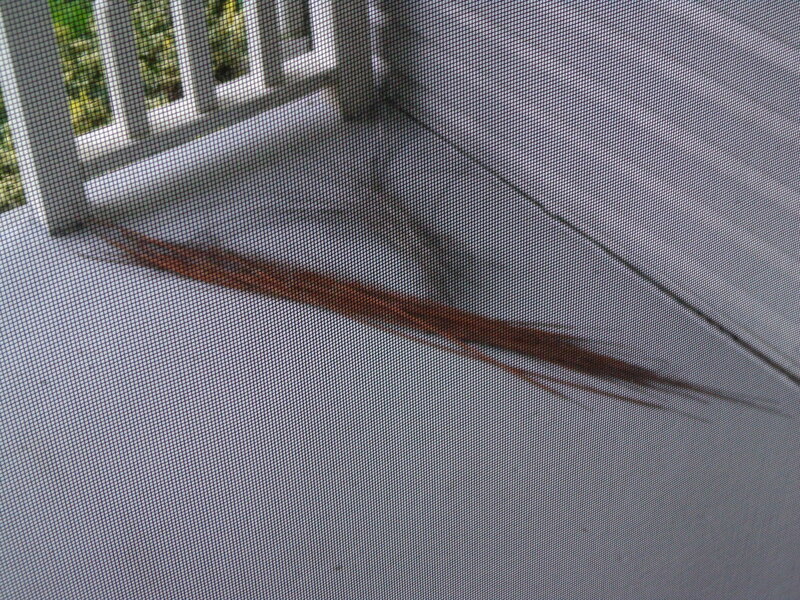 It doesn’t look like much, but it’s a pretty heavy bundle of strings that we placed on the front porch for now. 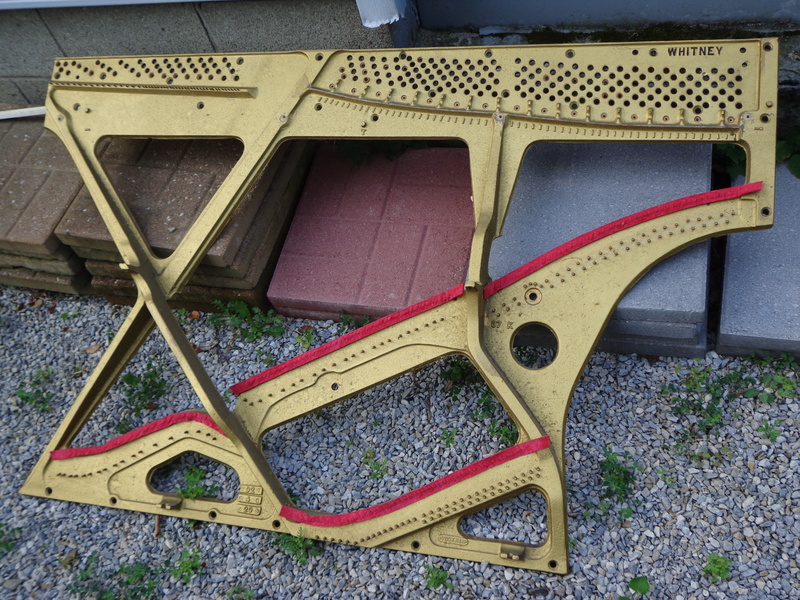 Once the strings were gone we were able to get the cast iron frame off, too. This was something that Jay could look at with a trained eye as his occupation involves casting iron. He doesn’t seem to think that this will fetch very much for scrap, but I think that every little bit is better than nothing. 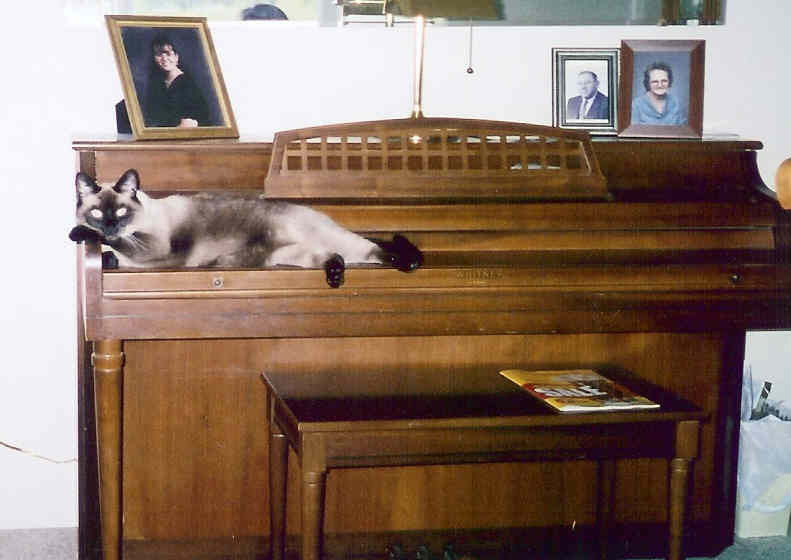 And so sits my old piano. 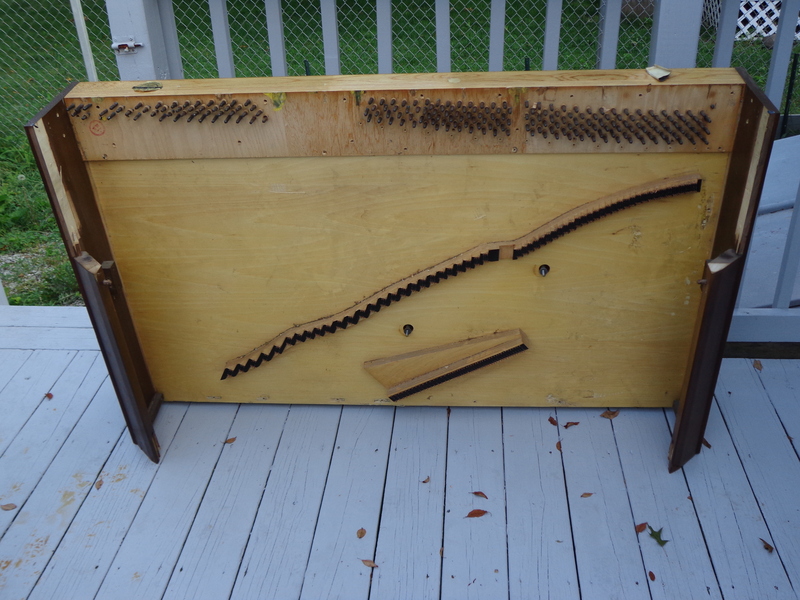 In a few hours it went from being able to play a symphony to being stripped naked and placed on the deck. Jay intends on breaking it down some more so that he can find room for the wood in his shop, but for now it sits like this. It’s a bit sad. I played on this piano for almost 18 years. 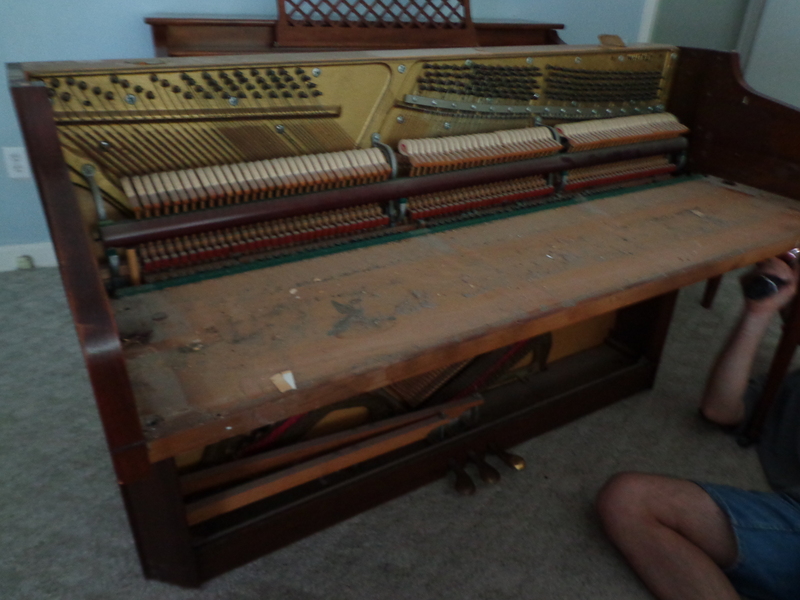 To the piano tuner it might have been a junky piano, but to me it was an enjoyable way to spend my time. Those strings had probably been hit a million times by my strikes on the keys. The consolation is that it’s not going to waste. It’s not going to sit in somebody’s house and collect dust. Instead I know that Jay will use the wood for some interesting and beautiful projects. This entry was posted in Music, My House, piano and tagged music, My House, piano. Bookmark the permalink. chrissy just love to play with you. If she heard you playing she would go right over to sit with you.